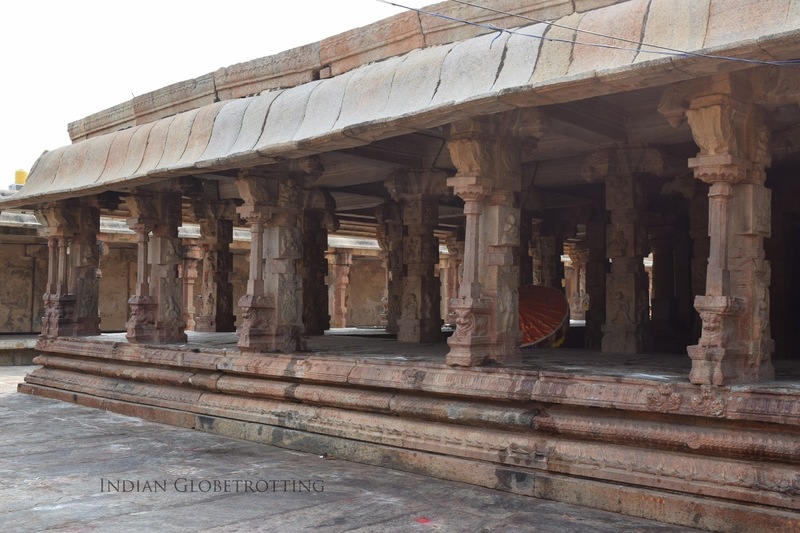 The Bhoga Nandeeshwara temple is a best example of Dravidian Architecture. This 1000 year old temple complex is believed to be constructed by the Bana Queen Ratnavali and later extended by the Ganga dynasty, Cholas, Hoysalas, Pallavas and finally by the Vijayanagara Kings. The temple complex has three shrines dedicated to Arunachaleshwara, Bhoga Nandeeshwara and Uma Maheshwara. The Arunachaleshwara temple in the south was built by the Gangas of Talakad and has a unique form of lord Ganesha called Simha Ganapathi or Ugra Ganapathi. There is a Nandi idol made of granite in front of the temple. 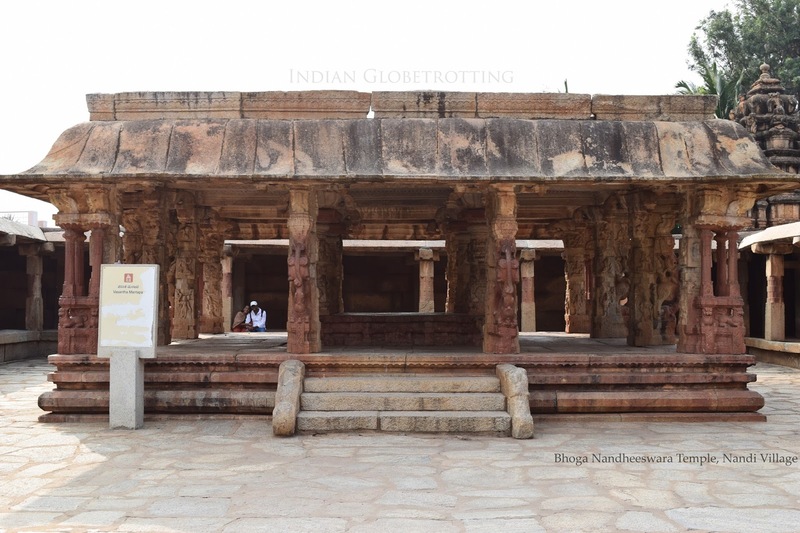 The Bhoga Nandeeshwara Temple in the north was built by the Chola king Rajendra Chola. 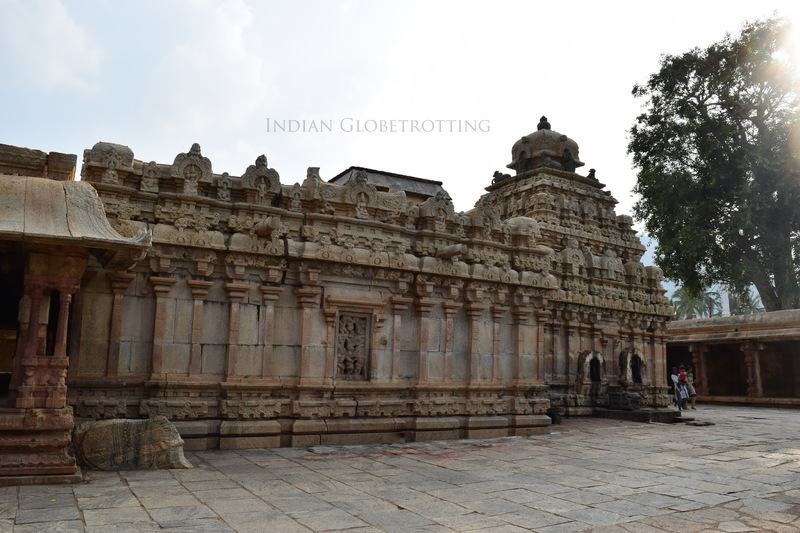 This temple dedicated to Lord Shiva and Parvathi is one of the oldest temples in Karnataka state. There is a figure of Chola king in this temple. The figure is believed to be of the Chola King Rajendra Chola. The Nandi Idol infornt of this temple is considered more attractive than the Nandi temple in front of Arunachaleshwara temple. Between the Bhoga Nandeeshwara and Arunachaleshwara temple is the Uma Maheshwara temple constructed by the Hoysala kings. The Uma Maheshwara temple has a Kalyana mantapa supported by ornate pillar which resembles to that of Hoysala architecture. These pillars made of black stone has carvings of Hindu gods Shiva and his consort Parvathi, Brahma the creator and Saraswathi, Vishnu and his consort Lakshmi, the god of fire Agni and his consort Swaha Devi. The outer wall and the buildings were added by the Vijayanagara kings in the 13th century. 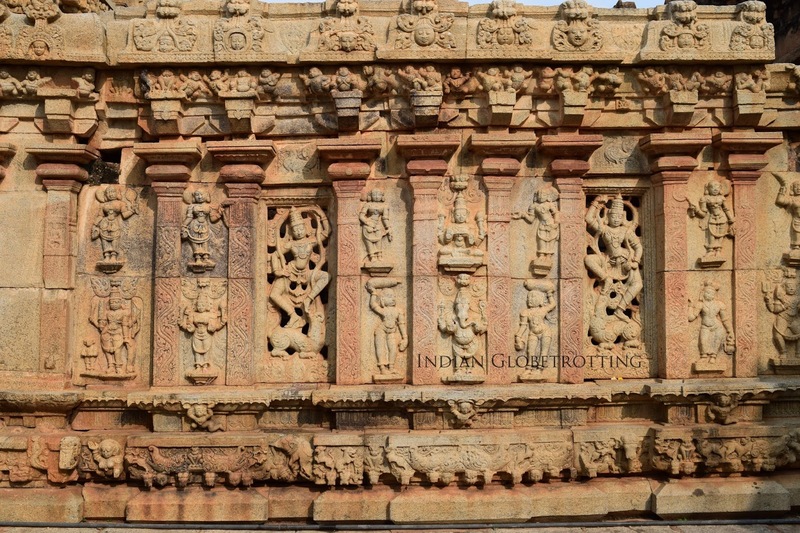 This 9th century Nolamba construction has many sculptures carved on the outer walls of the temple.it includes a dancing Shiva in the south wall of Arunachaleshwara shrine, Durga standing on a buffalo head in the north wall of Bhoga Nandeeshwara shrine. Each major shrine has a large linga in the sanctum with sculptures of Nandi in the pavilion facing the shrine. 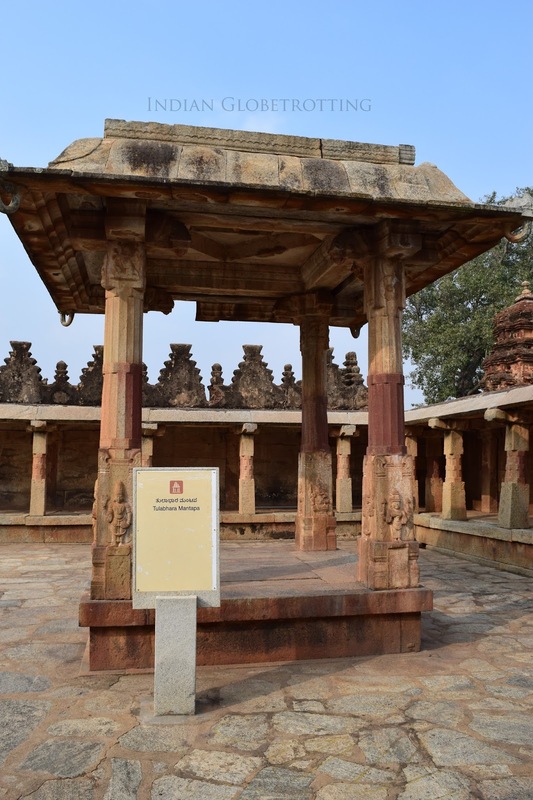 A pavilion with elegant pillars was added in between the Arunachaleshwara and Bhoga Nandeeshwara shrine during the 13th century Vijayanagara period. 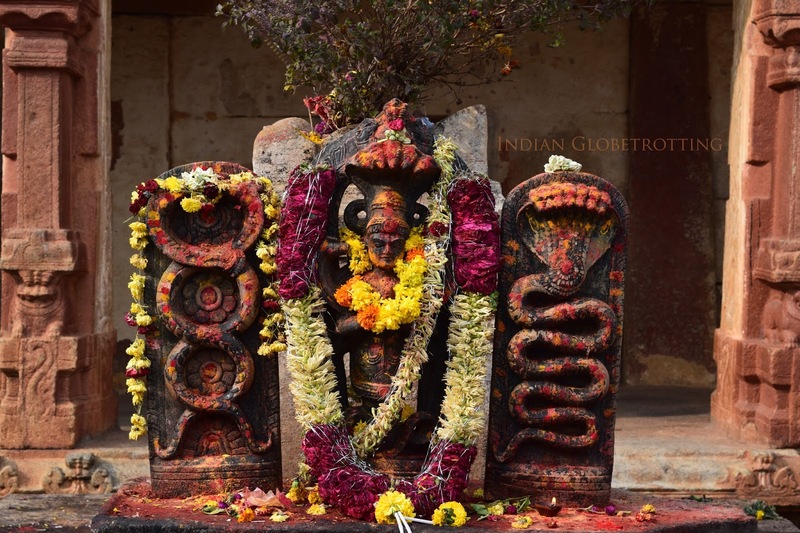 Arunachaleshwara and Bhoga Nandeeshwara form represent the two stages in the life of Lord Shiva, Childhood and youth. The Uma Maheshwara temple depicts the wedding scenes of Shiva and Parvathi and hence newly married couples visit this temple to get the blessings of Lord Shiva and Parvathi. The Yoga Nandeeshwara form on the hill top represents the final renunciation stage and hence no festivals are celebrated in the Yoga Narasimha temple on top of Nandi Hill. 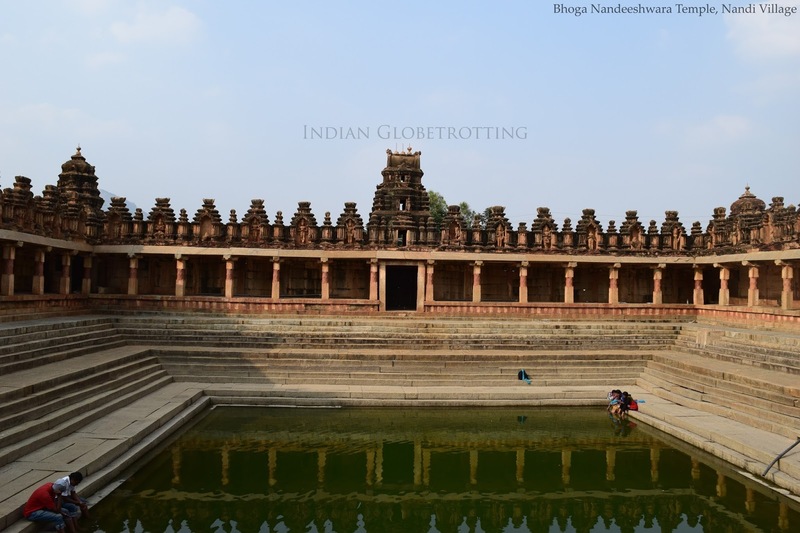 Another major attraction in the temple compound is the large stepped temple tank (Kalyani or Pushkarni) also known as Sringeri Teertha or Shringi Theertha. The Kalyani was constructed during the Vijayanagara period by Krishnadeva Raya. The pond is surrounded on all four sides by walkway and a running mantapa. The pond has steps leading down to it on all four sides. This pond is considered as the source of Pinakini (Pennar) river. The best time to visit Bhoga Nandeeshwara Temple is between the months of October and March. Really enjoyed this post, can't believe that temple dates from the 9th century! The architecture is simply stunning! Lovely photographs! Is there any opening time/closing time for the temple? Annadasoha every day in afternoon. Great article!!! Looks amazing and the photos are stunijng!! I can't wait to go to India to visit all of these beautiful temples! I absolutely love them! Thanks for sharing! Great Article, would help to plan a trip. This holy place is remarkable. would love to visit someday! Cheers! 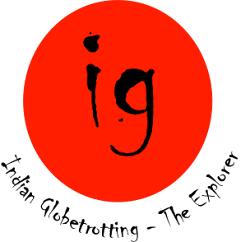 Hi, great posts and pictures. I can't believe how old that temple is.